US National Security Adviser arrives in Israel, warns Syria there's no change in US position against the use of chemical weapons. US National Security Adviser John Bolton on Saturday warned the Syrian government that it should not see the impending US military withdrawal from the country as an invitation to use chemical weapons, Reuters reported. “There is absolutely no change in the US position against the use of chemical weapons by the Syrian regime and absolutely no change in our position that any use of chemical weapons would be met by a very strong response, as we’ve done twice before,” Bolton told reporters on his plane shortly before landing in Israel. “So the regime, the Assad regime, should be under no illusions on that question,” warned Bolton. Chemical attacks in Syria in 2017 and 2018 led the US to launch punitive strikes against Syrian forces. In September, a senior US official said there was evidence showing chemical weapons were being prepared by Syrian government forces in Idlib, the last major rebel stronghold in the country. During his trip to the Middle East, Bolton will meet Prime Minister Binyamin Netanyahu and Turkish President Tayyip Erdogan. He said he was not suggesting Syria appeared ready to use chemical weapons. “As we elaborate how the (US troop) withdrawal is going to occur and the circumstances, we don’t want the Assad regime to see what we do as representing any diminution in our opposition to the use of weapons of mass destruction,” he said, according to Reuters. If chemical weapons were to be used, “a lot of options would be on the table … if they don’t heed the lessons of those two strikes the next one will be more telling,” Bolton warned. Trump recently unexpectedly announced that the US would withdraw its troops from Syria. Trump’s original order gave the military 30 days to pull out of Syria, but earlier this week officials said he had agreed to spread the withdrawal of the military from Syria over a period of about four months. A State Department official said on Friday that the US has no timeline for the withdrawal of American troops from Syria but does not plan to stay indefinitely. 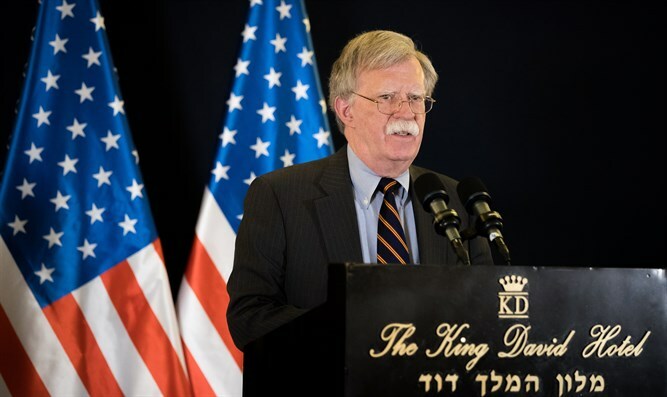 According to NBC News, Bolton plans to discuss with Israeli officials possible plans for maintaining some US forces at a base near the Jordanian border that has played a critical role in the US effort to diminish Iran's influence in the region.